Christmas was INSANE. Ray woke me up by thumping on the kitchen door at about 7am. I grabbed my robe and sweats and headed downstairs to let him outside. While he was out taking care of business, I put some food in his bowl, then let him back in and returned to the sink to clean up the cat dishes and a few things from the night before. I heard squeaking. I walked into the hallway and saw Ray with his first present, a roll of 4 squeaky kong tennis balls, already half unwrapped. He was going to town on the squeaker of one of them, tossing the package into the air, spinning around, tail wagging madly. I ran to get my cellphone to snap a few pictures but it was woefully unequal to the task of getting Ray in action on a dim morning. I ran to get my video camera. 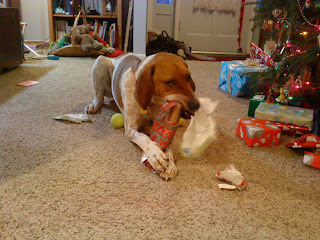 By the time I got back, Ray was working on his second present, a two- pack of flavored rawhide chews from my sister Kathy. I recorded the event which turned into a game of keepaway. Gregg came down to join us. Hugo watched balefully from the stairs. Gregg handed Ray his third present for the day and wished him a Merry Christmas. 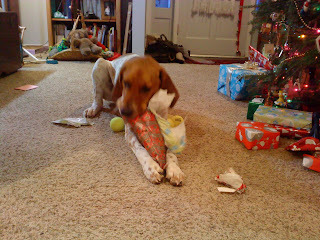 Ray settled down to open the present, revealing a rawhide bone with knots on the end like a pretzel. Another gameof keepaway ensued. Then back to the flavored rawhide bones. Then to the tennis balls. 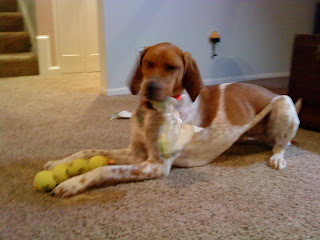 Ray killed the squeaker on one and returned to the rawhide chews. He picked one up and headed outside followed by his videographer. Another game of keepaway followed by a burial. We returned to the tree where Ray picked out a few of the cat toys and tried to open them. 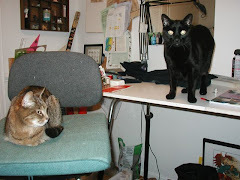 I insisted that he leave them for the cats. 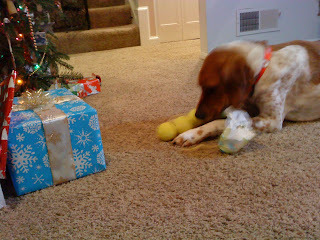 Then he picked up one of my presents and started to chew it. I took it away. He was nosing aggressively through everything interspersed with picking up his bones and tossing them in the air. (He quickly lost interest in the tennis balls.) Ray was a whirlwind of activity. Gregg and I opened a few presents but Ray was enthusiastically entering into the spirit of Christmas by trying to eat my two new hoodies (thanks mom! ), an earring box (thanks Kath! ), and other packages (thanks Mary!). We closed him off in the kitchen while we finished opening presents, put everything breakable or edible up, then let Ray out. He returned to his bones. We had visitors for cocktails and appetizers and Ray just could not contain himself. The excitement of visitors AND the smell of Lil'Smokies was just too much for him. After trying to sit on the couch for half an hour and hold a conversation where every other word was "Bah" and jumping up every two seconds to grab Ray's collar or nudge him away from the food, I had a lightbulb go off over my head. We still had a frozen marrow bone in the freezer. The marrow bone was offered to the hound who accepted it and retreated to have a nice chew next to the Christmas tree. Peace descended and to quote from Silent Night, "All was calm, All was bright..."
VIDEO ALERT! 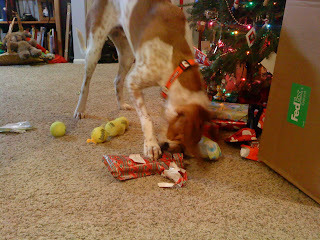 - Ray the Blind Dog at Christmas!